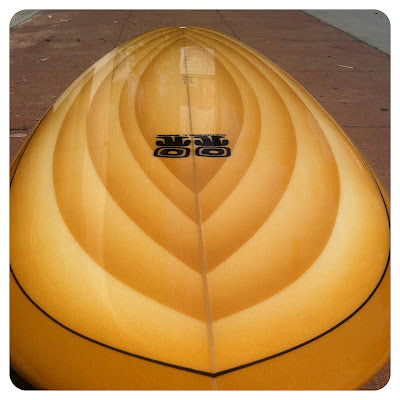 See the surfboards in person at Surfy Surfy Surf Shop in Leucadia! The theme of Surfy Surfy is surfboards! 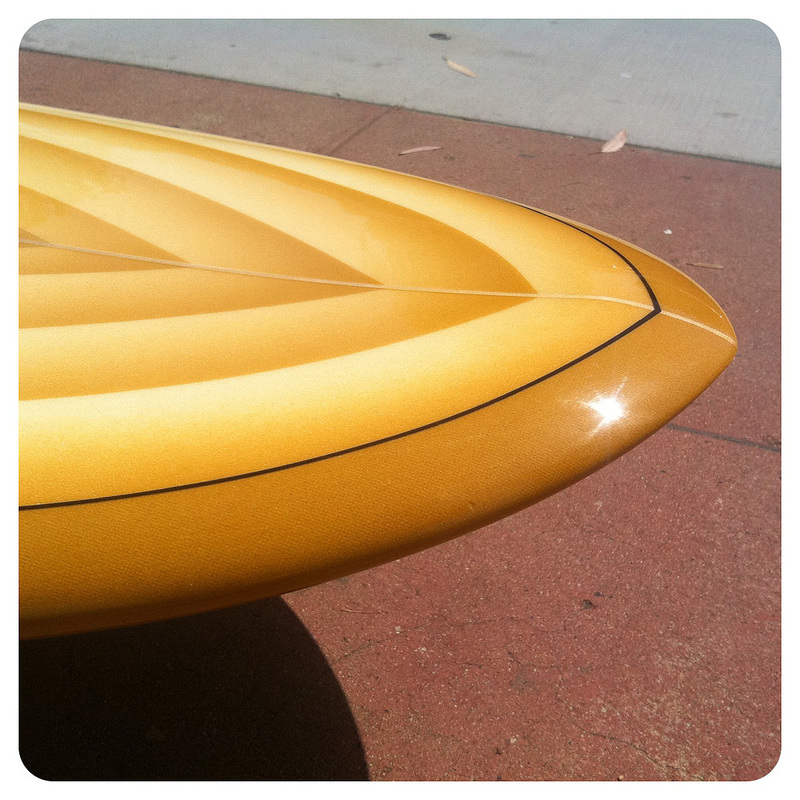 Specifically, handcrafted surfboards made in California. 1. The incredible Campbell Brothers Bonzer surfboards shaped by Malcolm Campbell in Oxnard, CA. 2. The user friendly performance modern retro boards from Gary Hanel (GH) handshaped right here in our hometown of Leucadia, California. 3. 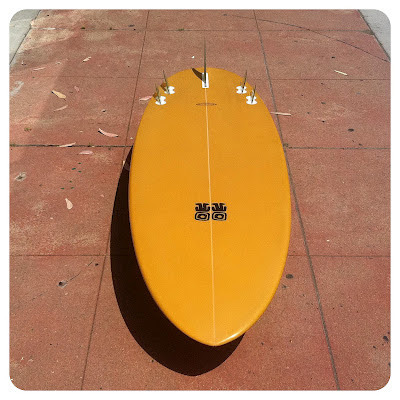 Special projects and finely foiled longboards by our local guru and underground industry legend Mike Slingerland in Encinitas, California. 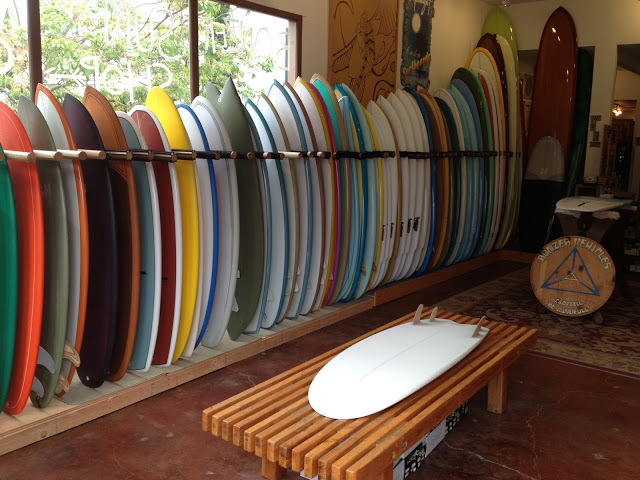 We often mix in high quality surfboards boards from various other talented shapers so be sure to visit the shop often. *UPDATE: we are currently not writing international custom orders. 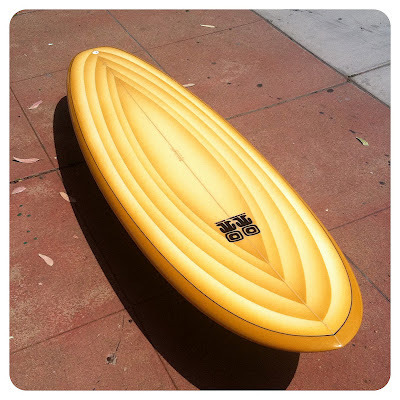 Shipping surfboards cost vary depending on your location. We can ship internationally. We will research your shipping cost for you after acquiring your address. 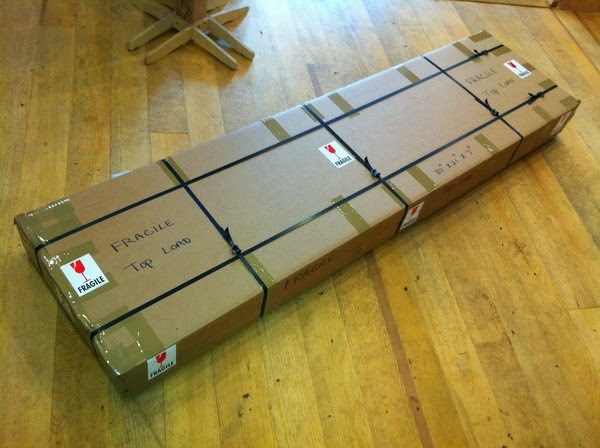 Customer pays the freight company separately. All surfboards are shipped by the world famous Sally St Pierre aka Moon Mom of Moonlight Glassing, widely regarded in the industry as the best in the business. 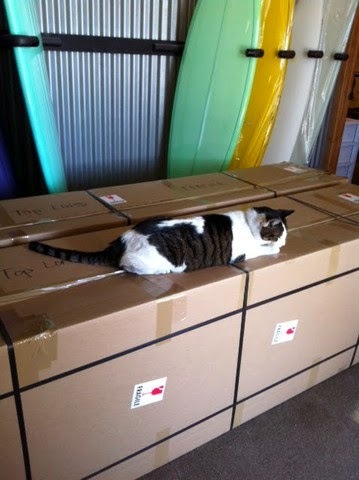 Moon Kitty surfboard box strength test. 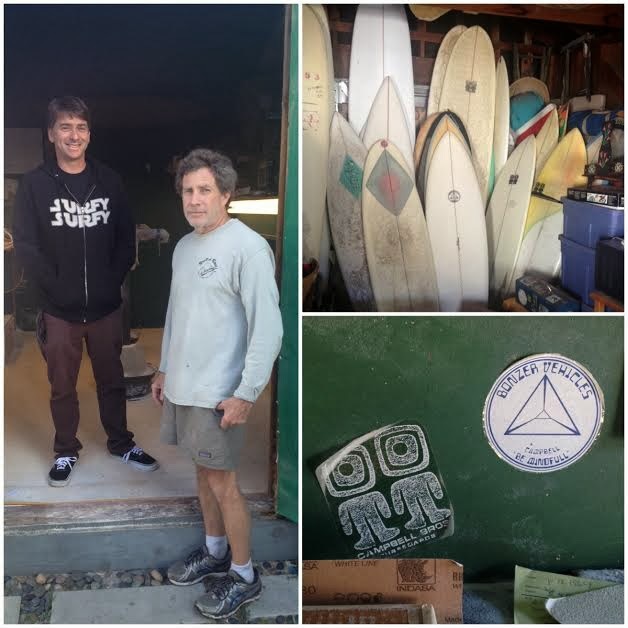 We drove the new shop van up to Oxnard today to pick up shaped blanks from Malcolm Campbell (right) (rare Surfy Selfie: the dork on the left) and wish him well on his International shaping tour. Surfy Surfy customers, we will continue to take orders and get them in the queue for Malcolm’s return. 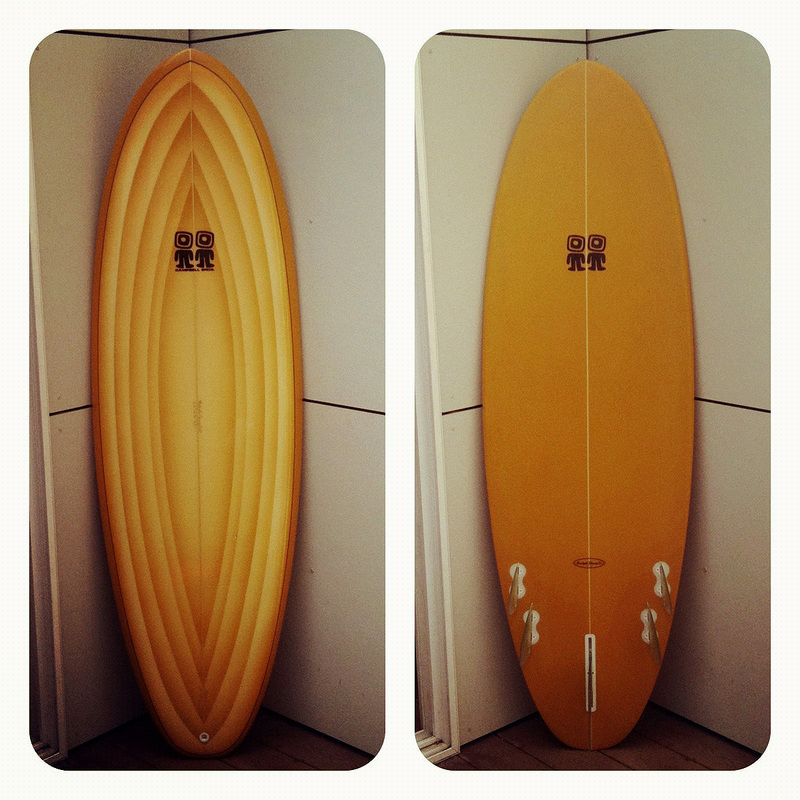 Existing Bonzer customers need not fret, we will get your board done and into your stoked little hands! 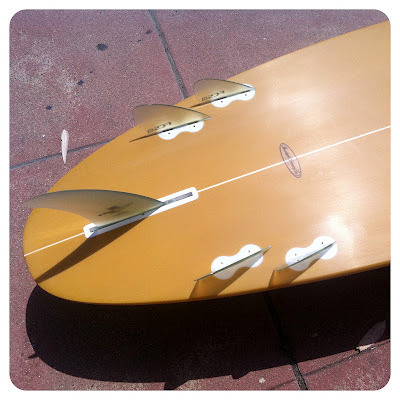 There are currently 500-ish posts with label BONZER on the Surfy Surfy blog. Campbell Brothers Bonzer Surfboards are the cornerstone of my surfing existence. 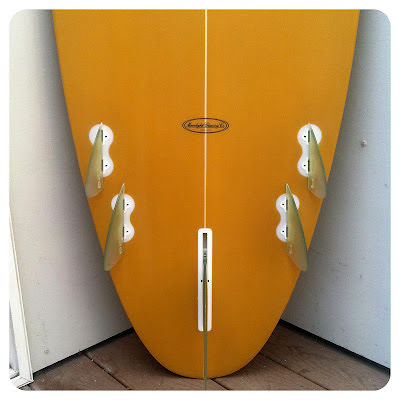 Remember, we now pack and ship surfboards directly from our retail location here in Leucadia, California. Getting boards from California to the East Coast and Japan is easy, shipping to Europe and Australia from California is very costly, so make sure you take advantage of Malcolm’s tour dates! Shaped by Malcolm Campbell, one of the most versatile surfboard shapers on Earth. Built at Moonlight Glassing with 1st quality materials and extras. 5/4 oz s-cloth deck with back foot patch. 5 oz bottom with fin cluster reinforcement patch. Airbrush, gloss and polish deck and rails, wetsand gloss bottom. FCS Fusion system and center box for easy travel. Board includes all 5 fins ($125 value). 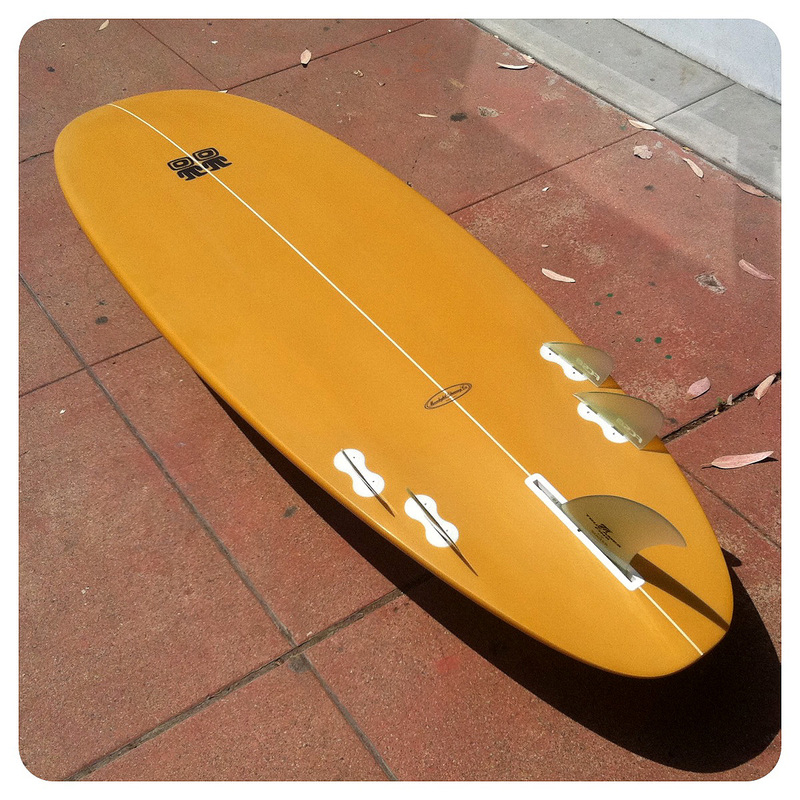 This Bonzer has foam, float and drive for all your Surfy needs. *update-this board is SOLD, thanks!